#ThatBusinessShow ends week 24 today. Please help support the show, past guest and sponsors by visiting http://www.tampabayradio.com and clicking on our guest network tab and the preferred providers link on the home page to support show participants. All shows available On Demand at that site as well as on my YouTube channel here – https://www.youtube.com/user/jamiemeloni. 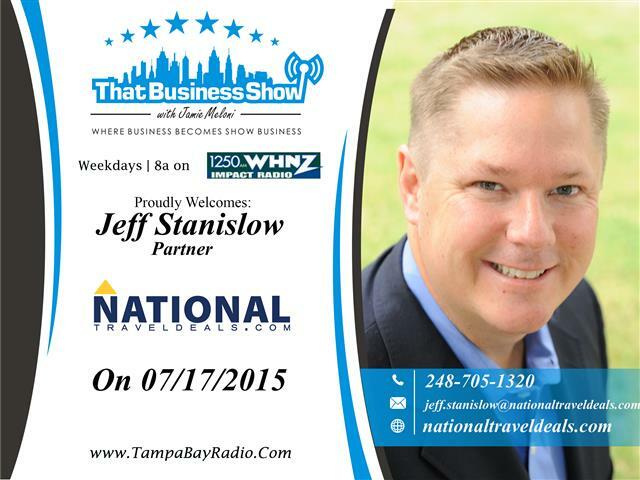 My first guest on today’s show was Jeff Stanislow, Partner with National TravelDeals.Com. This Tampa based online travel agent currently offers rental car services on their site http://www.nationaltraveldeals.com and will soon be offering hotel and airline deals as well. Jeff is an online marketing specialist and has built two other Internet and Advertising agencies, most recently Chief Internet Marketer. He is an adjunct professor with Walsh College and teaches graduate level classes in interactive marketing. Jeff and I spoke of Uber and Lyft primarily in the first segment. With the announcement today that LAX is allowing these ride sharing programs to operate inside their airport, this was a topical discussion and is foreshadowing of what to expect in the transportation/tourism business. With reduced overhead, services like Uber and Lyft present a disruption in traditional taxi services and a challenge to industry regulators because of the complaints from taxi unions of increased costs due to taxes and regulatory fees versus consumers who like the convenience and lower costs of the ride sharing options. Some communities have banned the service altogether but many consumers are pushing back and the future of the service remains to be seen. Jeff also shared some top travel destinations and industry insights as well as what is on the horizon in the travel industry in this segment. Be sure to keep an eye on http://www.nationaltraveldeals.com for your next trip as the site develops and grows into a leading online travel agency! Jeff can be reached at 248-705-1320 or jeff.stanislow@nationaltraveldeals.com for more information! 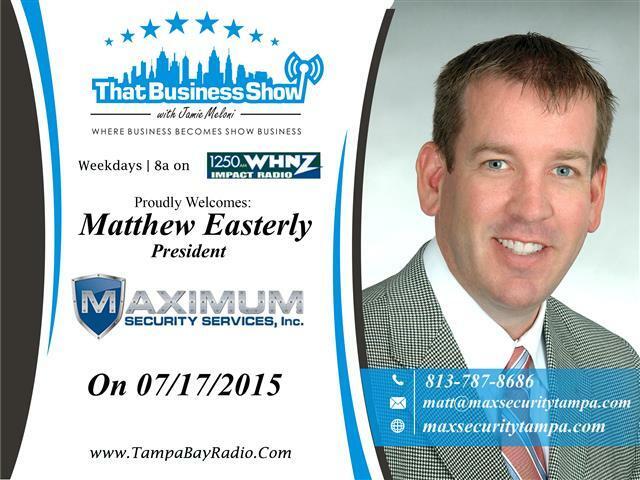 On the 2nd half of the show, I spoke with Matthew Easterly, President of Maximum Security Services. Matthew has over 16 years of security industry experience and decided to launch his own company after seeing the diminished quality of service that the larger big box providers were giving to consumers. Matt’s service offers local, instant access to the man in charge in the event of a problem and he talks about some of the problems that the larger security providers have in their business models on this segment. With the recent rash of break ins in the South Tampa community, security needs to be on the minds of all business owners. Matt speaks of the development of a new South Tampa business watch program being put together by the South Tampa Chamber of Commerce along with the Tampa Police Department on the show as well. Matt also shares some great tips on this interview including what to look for in a security system provider and what is new and exciting in the industry. One of the more interesting developments in the industry include the introduction of facial recognition cameras that can now be added to security systems that can distinguish unknown occupants from known occupants inside your home or business also. Please contact Matthew Easterly for all your security needs and he will not tie you up in a long term contract like the larger providers do and his services are reasonably priced and you can reach him locally with a problem. Visit http://www.maxsecuritytampa.com for more information and call him today at 813-787-8686 or email at matt@maxsecuritytampa.com for more information! This entry was posted in Entrepreneurship and Business and tagged bank owned, business, entrepreneur, foreclosures, lyft, networking, online travel agent, security, security systems, tourism, travel, uber. Bookmark the permalink.